by Rob and Hugh Dunsterville, Published by the Midland Automobile Club (Est. 1901) Ltd.
Shelsley Walsh Hill Climb, Worcester WR6 6RP. £15.00 including P&P. 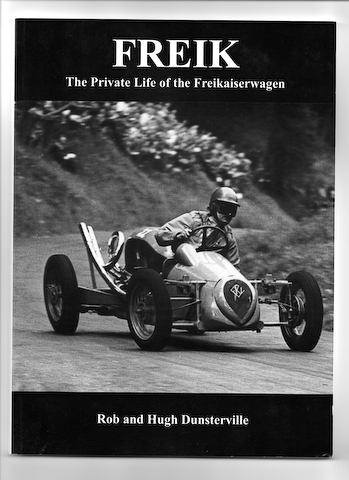 The tale of how David Fry and Hugh Dunsterville set about creating a legendary hill climb special over 70 years ago is meticulously recorded in this superbly detailed book. In the opening chapter, ‘Setting The Scene’, the authors graphically describe the sensation caused when this unique single seater set a new outright record at Shelsley Walsh in June 1949. This short introduction is enough to make a reader want to know precisely how this remarkable achievement eventually came about. Fry and Dunsterville first met in 1935 when the latter bought a secondhand 1934 MG PA Midget from the elder son of Cecil Fry, head of the world-famous Bristol-based chocolate company. The two became good friends and competed individually in local car club events until May 1936 when they decided to build a ‘Special’ together. The concept was to use an existing lightweight chassis with a motor cycle engine and gearbox mounted behind the driver and chain drive to the rear axle. For a few pounds they bought a GN Cyclecar (with four-chain transmission and a solid axle) and a three-wheeler Morgan powered by a 1,097cc V-twin Anzani engine from a nearby scrapyard and set about the construction. The many trials and tribulations that the pair encountered during the development of the Freikaiserwagen make entertaining reading. Although its subject matter would seem to suggest that this book is the ultimate in ‘niche publications’ I found it most enjoyable.